Homemade sweet potato pasties | Bedroom is finally taking shape! It’s been the most neglected room in the flat but we’ve got it looking nice at last! | Just about the prettiest lemonade out there | Chilli dogs! | Spending a Sunday afternoon at Jamie’s Italian | Primark is on point this season! Love this pj style blouse | Thunderstorms! 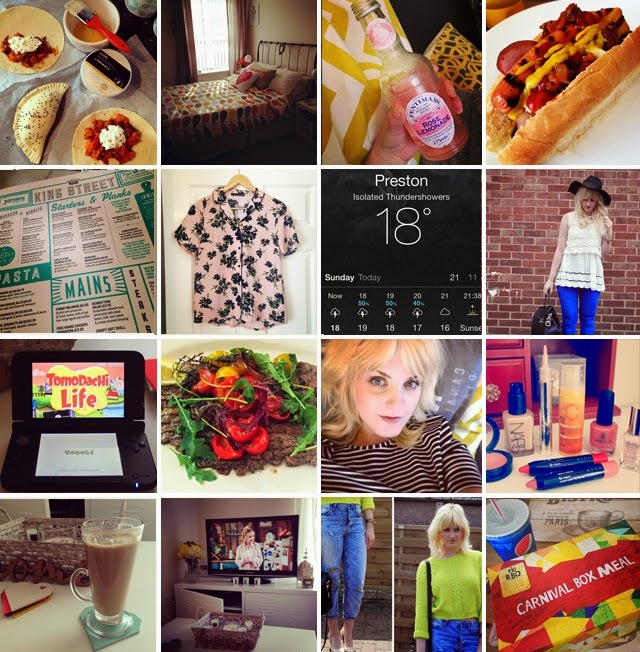 | Outfit snapping in my pretty new blouse | Hooked on Tomodachi Life on the 3DS | Reviewed my incredible steak from Jamie’s Italian | Friday night chill time | Just a few of my May beauty favourites | Sunday morning latte (decaf of course!) | Friends marathon | Stepping out of my comfort zone in neon knitwear | Finishing the weekend with a cheeky KFC!